This week's SmackDown Live is the final SmackDown before Fastlane 2018 on Mar. 11, 2018! Press F5 or refresh for more updates during the show. Dasha Fuentes opens Smackdown by introducing Charlotte Flair. She then introduces Ruby Riott. Dasha: "Ruby, I'll begin with you. This all began when you targeted Charlotte Flair a month ago--"
Ruby: "Dasha, that's not where this all began. You're clearly ill-informed, and I'll take it from here. See, this all began November 14th, 2017, when Charlotte Flair became the Smackdown Women's Champion. You see, all her life, Charlotte's been set up for success. Charlotte Flair, the perfect woman. I mean, she's tall, blonde, athletic, cunning, and the daughter of a two-time Hall of Famer. On November 14th, when Charlotte won the Women's Title, she became the first woman in history to win the NXT, Divas, Raw and Smackdown Women's Championships. And I watched as the myth began to form, the myth that Charlotte was the personification of the Women's Revolution. And that's why, two months after you won the title, Charlotte, I formed the Riott Squad. With one purpose: to destroy the myth." Charlotte: "The only myth that exists about me is that I've been handed anything in my life. I've had to work hard, probably harder than others, because of who I am. I've had the weight of expectations on my shoulders, do you know how stressful that is? If I fail, I let down my entire family. And I can't just succeed to succeed, I have to transcend. And the fact that I've accomplished all that I have proves I am as good as I say I am. And Ruby, you'll find out." Ruby: "That's what makes this all the more exciting. Whether you were elevated, or whether you put yourself there, you're on a pedestal. And that's all on the line this Sunday. When I beat you, you're going to be just another bleach blonde failure with a famous last name." Ruby nods to the rest of the Riott Squad, who enter the ring. Bobby Roode comes out! Smackdown goes to commercial. Back on air, the situation with the four women has ended and Bobby Roode is on commentary. Lockup, Jinder with an arm wrench, keylock, Orton reverses into a hammerlock, Jinder breaks with a single elbow, side headlock, Orton whips out, Jinder with a shoulder tackle, off the ropes, Orton leapfrogs, hits an elbow, Jinder with punches, chop in the corner, punch to the gut, whip, Orton ducks a clothesline, goes for an RKO, blocked, commercial. Back on air, Jinder has Orton in a chinlock with an armbar, Orton elbows his way out, boot to the face, Jinder with a high knee lift for two, knees, keylock/chinlock combo, Orton punches his way out, Jinder with a boot, Orton with a high angle back suplex, pair of clotheslines, powerslam, hangman's DDT, blocked, hits a fallaway slam instead, punches on the ropes, whip, reversed, Orton with an Orton backbreaker, Jinder to the floor, Orton follows, Sunil Singh gets between them, eats another massive back suplex onto the announce table, Orton tosses Jinder into Roode, then back into the ring, hangman's DDT, calls for an RKO, Roode gets up on the apron and yells at him, Jinder knees Orton into Roode, Kulas for three. Sami Zayn hypes Kevin Owens up for the six-pack challenge, Owens reasserts that it's every man for himself, but brings up how Sami Zayn said he would lay down for him, but says he's having trouble believing it. Zayn says he owes Owens his current relevance, and knows that his own time will come some day. They hug. In a hand-cam promo, Baron Corbin says he's grateful that John Cena is in the six-pack challenge, because it means he can get him back for costing him his Money in the Bank match. Dasha interviews Shinsuke Nakamura, who says he can win at Wrestlemania with a knee to the face. Although he's blocked from saying "face" by Rusev and Aiden English walking in. Rusev says that Aiden English's throat was injured last week. Rusev challenges him to a match at Fastlane. Shinsuke accepts, but says that, when he wins, Sunday will be Nakamura Day. He sings "Nakamura Day" in an almost perfect Aiden English impression. This match was made last week during Carmella's Twitter Q&A. Lockup, Carmella with a knee o the gut, whip to the corner, dumps Becky to the apron, Becky with elbows, goes up top, Carmella with a forearm, hurricanrana, mounted punches for two, face wash across the canvas, tosses Becky's head into the mat, drags her up, Becky with punches to the gut, whip, Becky rolls her into a Disarmer, blocked, Carmella tosses Becky into the corner, blocks a stomp, tosses her into the ring post, punch, tarantula, hair pull, chop, cover for two, rolls Becky to the floor, follows, tosses her into the barricade, then a second time, stomps, toss into the apron, cover for two, chinlock, Becky elbows her way out, Carmella with a chop, Becky with a dropkick, trading forearms, Becky with an uppercut, Carmella with a side thrust kick for two as Becky gets the ropes, Carmella throws a tantrum and kicks the rope, Becky with a Bexploder, Carmella with a knee, wheelbarrow snapmare, Becky rolls into a Disarmer for the tapout. Backstage, Naomi was watching. Natalya walks in and calls Becky lucky, and says that Carmella had the flu all weekend. She tells Naomi to stay away from Becky because she drags people down. Naomi says that Nattie's just jealous that people actually like her. Nattie says that Becky knew not to challenge her, Naomi challenges her to a tag match at Fastlane. The announcers formally announce the Greatest Royal Rumble for April 27th in Saudi Arabia. 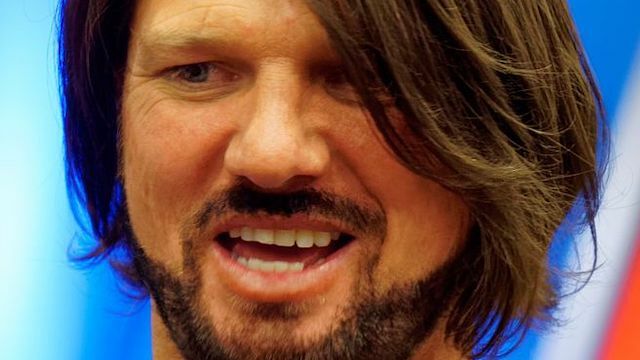 AJ Styles hits the ring. "You know, it wasn't long ago that I only cared about one person. But I've got to tell you, after winning the WWE Championship for the second time, I see the world a little differently. I am the WWE Champion. But here's the thing: it's a grind to get here, and it makes me think about all the years I spent somewhere else trying to get here, grinding to get here. That grind continues two years later, and that brings me to Fastlane. I do not have to get pinned to lose my championship. Surprise, surprise, the odds are stacked against me. I'm not going to stand here and cry that it's not fair, because to hell with fair. I'm going to overcome, because this is Smackdown Live, the house that AJ Styles built! But sometimes life gets to us. Sometimes we don't win. Last week, John Cena pinned me clean, right here in the middle of this ring. The thing is, John Cena's world class, I'm not taking anything against John, I get it. Not that I needed motivation, but John's never shy for words. Watch this. (clip of Cena on Raw last night) You see, John's not the only one who has to win at Fastlane to pave his road to Wrestlemania. And he did say that, if and when he wins, I can cash in my rematch at Wrestlemania. But that's not what I want. And correct me if I'm wrong, WWE Universe, that's not what you want either. I want my Wrestlemania moment. And that's taking the most prestigious championship in our business on the grandest stage of them all, and defending it against the best. And he has every right to call himself the best. I want you, Shinsuke Nakamura. Who would've thought, who would have ever dreamed, that this match would ever happen in WWE. So this Sunday at Fastlane, I'm not just fighting for myself, I'm fighting for us. Because trust me when I say this, it will be nothing short of phenomenal." Dolph Ziggler comes out. "Let me get this straight, you said 'this is for us, I'm gonna do it for us!' You used to be cool, man. This is the house that AJ Styles built! But you're not phenomenal anymore. You're just desperate." "I'm desperate? This coming from the guy who's been in WWE for 13 years and still hasn't reached his full potential?" "Says the guy who took a decade to make it to the house that I built! It's cool, man, I'm a fan. But this Sunday, you're going to lose. It's not that you're not great, it's not that you're not phenomenal, it's that your head's not in the right place. You're doing it for these people. Let me tell you about these people. The second you slip up, the second you fail even a little, they will turn on you. It happened to me. They told me I would never be a champion here. But every roadblock they put in front of me, every obstacle, I overcame it, and I became World Heavyweight Champion! And it was for these people. But they didn't deserve it. They did what they always did, they sat on the sidelines. I continued to be the best, I proved it every night, but the fact that I have yet to have just one singles match at Wrestlemania is criminal! So you can take your dreams, you can take your dream match, and shove it." "You know, you're talking a lot, but since we have a match later tonight, why don't we just do it now?" AJ ducks a superkick, Dolph ducks a Styles Clash, rolls to the floor, back in, Dolph with a side headlock, AJ reverses into a front facelock, break, AJ with a rear waistlock, Dolph elbows his way out, punch, rollup for two, AJ with an amateur takedown, chinlock, Dolph with a snapmare, dropkick, toss to the corner, snapmare, elbow drop for one, chinlock, AJ elbows his way out, whip, dropkick, Dolph to the floor, AJ with a springboard forearm, commercial. Back on air, AJ beats a count at 9, Dolph with a punch, punch in the corner, stomp, face wash across the top rope, trading punches, AJ goes off the top rope, Dolph with a back body drop for two, AJ with mixed strikes, running leaping forearm, leaping clothesline in the corner, fireman's carry, blocked, Dolph rakes the eyes, Fameasser for two, trading punches, Dolph with a forearm to the skull, AJ rolls to the apron, Dolph grabs him, suplex, blocked, AJ goes for a suplex, blocked, repeat, AJ finally brings Dolph to the apron, Dolph catapults AJ into the ring post, commercial. Back on air, Dolph is punching AJ in the ropes, goes for a Styles Clash on AJ, AJ rolls into a Calf Crusher, Dolph blocks, AJ goes for a superkick, blocked, Dolph hits a Zig Zag for two, Kevin Owens and Sami Zayn hit the ring and start beating on both competitors. They keep beating down AJ and Dolph until Shane comes out. "Kevin, Sami, what are you doing? You trying to take out two of your opponents before your six-pack challenge? Why don't you about-face and get back in that ring? Where are my manners, what's up, Green Bay? I know what you're thinking, the commissioner is about to make a tag team match. Now that would be great, but one of the mantras Daniel Bryan and I like to live by is to bring out the best in everyone, so why don't we make it AJ Styles vs. Dolph Ziggler vs. Kevin Owens vs. Sami Zayn vs. this man, and let's make it a Fatal Five-Way Match." Match begins during a commercial. Back on air, Sami and KO are tossing people around outside the ring, Corbin reverses and tosses KO into the barricade, does the same to Sami twice, rolls him into the ring, punch to the chest in the corner, stomps, forearm, AJ grabs him, Corbin hits him with a forearm, trades shots with KO, gets the better of it, punch to Dolph, another, whip to AJ to the corner, tosses him across the ring, charges at Dolph, Dolph drops him to the floor, KO and Sami toss Corbin into the steel steps, stomps AJ in the corner, Sami whips Dolph, clothesline, KO with a running senton to Dolph for two, Sami clears Corbin from the ring, KO foot chokes Dolph in the corner, Sami drags AJ up, baseball slide to Corbin, KO stomps AJ, Sami with a whip, drop toehold, Owens with a running senton to the back for two while Sami watches, then he stomps Dolph, KO with a choke, stomps Baron from the ring, Sami drags Corbin up on the apron, Corbin tosses Sami to the mat, punches KO, back in the ring, KO with a superkick, Dolph tosses KO into the ring post, Sami hits Dolph with a Helluva Kick, AJ with a Pele to Sami, commercial. Back on air, Dolph blocks AJ from superplexing Sami, joins him, KO and Corbin join in to make it a tower of doom, Corbin starts throwing running forearms, Sami tosses him to the corner and takes his place, Corbin and Ziggler bonk heads, Blue Thunder Bomb to Dolph for two as AJ breaks the count, Sami tosses AJ to the floor, Dolph tosses Sami to the floor, KO German suplexes Dolph goes for a cannonball, Corbin tries to interject, KO tosses him into the ringpost, cannonball to Dolph, springboard elbow to Corbin for two as AJ breaks the count, KO tosses AJ to the floor, Dolph with a kick, Corbin goes for a back suplex, blocked, Dolph tosses him to the floor, superkick to Sami for two as AJ breaks the count, Corbin punches AJ, AJ responds, goes to the apron, springboard, Corbin punches him out of the air, Dolph tosses Corbin to the floor, Corbin rebounds and hits the ring, chokeslam backbreaker to Dolph, Deep Six to Owens for two as AJ breaks the count, hits Corbin with a kick, clotheslines him over the top rope, Dolph goes for a German to AJ, AJ blocks with an elbow, kick, Sami tackles AJ from behind, AJ hits a moonsault reverse DDT, climbs to the apron, kicks Corbin in the face, punches Dolph, tosses him to the floor, forearm to Sami, KO with a forearm to AJ, Sami hits a Helluva Kick on Kevin Owens for three. Dasha Fuentes asks Sami Zayn why he just did that. "Why what, Dasha? Pretty vague question, why? Why? Why? How about this? Because I am the best Smackdown has. Because ever since I came to Smackdown, I have been without a doubt the most overlooked man on the roster. How about that, Dasha? Tonight wasn't for the WWE Championship, it was about proving who is the best, and I proved that it is Sami Zayn!" Smackdown goes off the air with AJ Styles and Kevin Owens looking on in bewilderment.